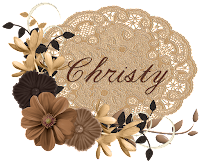 Create With Christy: Snowflake Showcase Countdown - Only Hours Left! Snowflake Showcase Countdown - Only Hours Left! 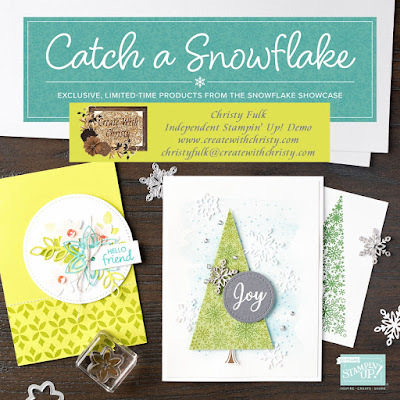 I can't believe that there are only hours left to purchase the products that are in the Snowflake Showcase! 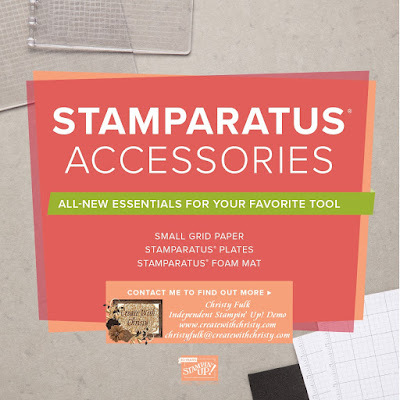 I'm REALLY going to miss making projects for you with these wonderful stamp sets, dies, and embellishments! BELIEVE ME...YOU DON'T WANT TO MISS OUT GETTING THESE BEAUTIFUL PRODUCTS! 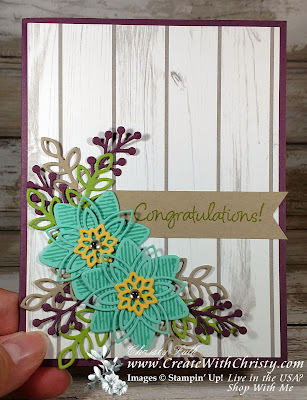 I used the Happiness Surrounds Stamp Set and Snowfall Thinlits Dies on today's card. The wood background is paper from the Festive Farmhouse Designer Series Paper from the Holiday Catalog. I also used the clear epoxy droplets from the Frosted & Clear Epoxy Droplets, also from the Holiday Catalog. Hurry, They're Only Available Until 11:50 p.m. TONIGHT! After That, They're Gone Forever! You Can Click on Each Picture to See It and/or Order It at My Online Store. Festive Farmhouse Designer Series Paper (DSP): 4" x 5-1/4"
Fold the large Fresh Fig piece in half (fold on the left) to form the card base. Attach the DSP piece onto the center of the card front. Stamp the striped flower stamp from the Happiness Surrounds Stamp Set onto one side of the Coastal Cabana piece two times using the Coastal Cabana Classic Stampin' Pad. Die-cut the stamped flowers with the coordinating die from the Snowfall Thinlits Dies. Die-cut the detailed flower die out of the same piece two times. Put SNAIL Adhesive onto the back center of the detailed flower die-cuts. Attach each one to the top of the stamped flowers (see picture). Die-cut the flower center die two times out of the Daffodil Delight piece, and attach them to the flower centers using Mini Glue Dots. Die-cut the berry branch die four times out of the smallest Fresh Fig piece. Die-cut both leaf branch dies two times from the Granny Apple Green piece, and again out of the largest Crumb Cake piece. This will leave you with four green leaf branches and four tan leaf branches. Punch the right end of the smallest Crumb Cake piece by inserting it all of the way into the Banner Triple Punch, making sure to center it within the smallest guide in the punch. 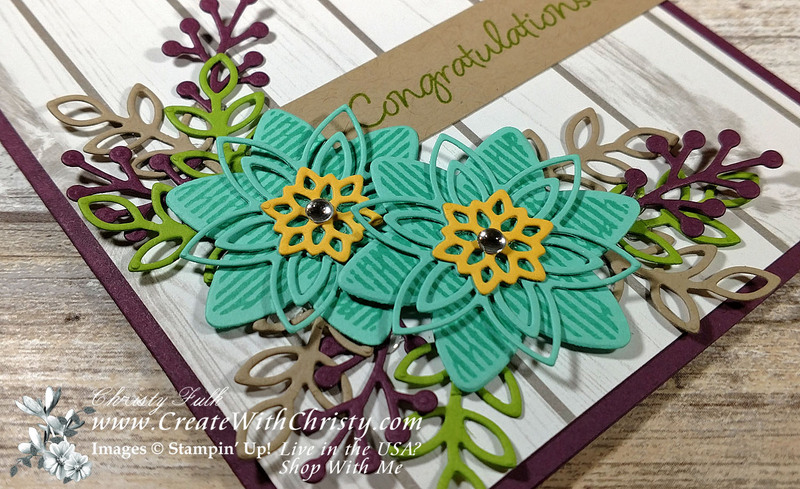 Stamp the "Congratulations" stamp onto the right end of the banner using the Granny Apple Green Classic Stampin' Pad. 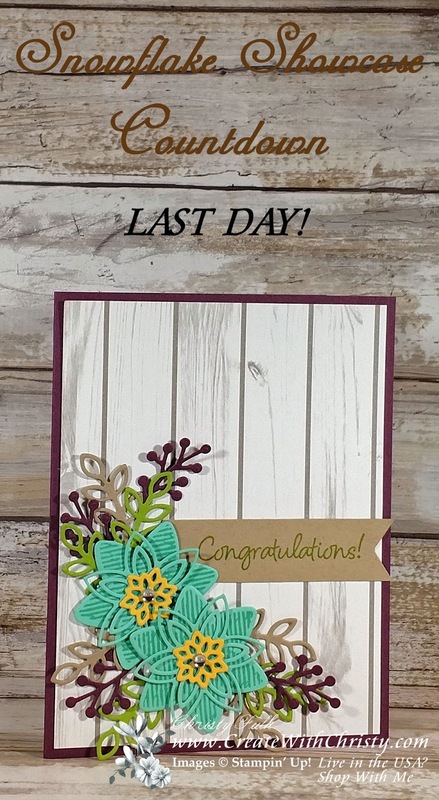 Attach the flowers onto the bottom left of the card. 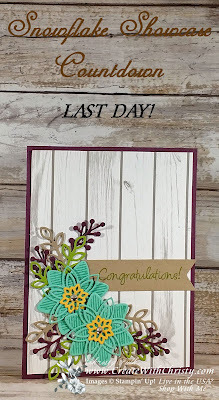 The top flower needs to be attached first with SNAIL Adhesive, and the bottom one needs to be attached with Stampin' Dimensionals (see picture for placement). Attach all of the branches around the flowers using Mini Glue Dots (see picture for placement). Attach a small clear epoxy droplet from the Frosted & Clear Epoxy Droplets onto the center of each flower. DON'T FORGET ABOUT MY DOILY REWARDS PROGRAM AND THIS MONTH'S HOST CODE. Click on the Doily Rewards picture below to find out more. This Host Code Ends TONIGHT! The November Host Code Ends TODAY. Last 48-Hour Online Extravaganza Sale NOW! 2nd 48-Hour Online Extravaganza Sale NOW! First 48-Hour Online Extravaganza Sale NOW! Online Extravaganza Starts THIS Friday! Some Holiday Catalog Products are ALMOST GONE!